Guest Blogging is one of the ultimate way to gain traffic to your blog and also a medium to join the community of your niche industry bloggers. When you guest post on a high PR blog, the amount of visitors visiting your guest post will also click on your backlink to your blog reading your Author Bio. Guest blogging is not only a traffic providing option but also an experience gainer and a knowledge provider in terms of your niche. You may think having a own blog, is it necessary to guest blog on other blogs? Yes! !, It is necessary to guest blog on other blogs if you're concerned about popularizing your blog name to the world. 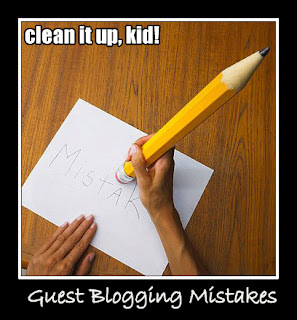 Many Bloggers will make mistakes when it comes to Guest Blogging. Not only the mistakes cost deleting their post on the blog, but also it destroys name in the blogging community. Continue Reading to avoid the common mistakes that every blogger makes when they decide to guest blog on a popular blog. This is the first mistake that every blogger does. They want to write a Guest Post. They target on popular blogs that they find according to the PR and the name in the blogger community. They never see on what niche they are going to blog about. Even though it not always happens because the blog owner rejects in most of the times in terms of unrelated niche. Some may accept to post. But it is not useful for you when your blog is concerned about a niche that is too different from the niche you guest blog at. For example, you blog on internet marketing strategies, then choose the blogs that are familiar to your niche. You can find blogs like Kissmetrics, Copyblogger, Problogger etc., and request for guest post with your ideas. When I quoted the heading Poor Choice of Words, I meant frequent grammatical errors and lack of words. I am not offending any of the bloggers. Simple English that any grader can understand is more than enough to write a beautiful post. And also its your duty to raincheck your posts for errors and mistakes. It is always a fact that when any visitor reads your guest post on any popular blog, they expect perfection because of the blog's name. And when they find any mistake say spelling errors, it destroys both their blog and yours. The traffic to your blog will reduce to a level that you'll will never imagine. Before sending the fair draft to the blog owners, raincheck for any grammatical errors and spelling mistakes. I'm sure that WYSIWYG editor for wordpress have spell checker. Check for the mistakes twice before sending your post. The blog owner will never have the time to check your post for errors like you do. Once the check is finished, then send it to the blog. This might seem odd, but actually every blogger does it. When writing a niche post on any blog, they just include so many links that the post can't afford. It is an irritating moment for the blog owner to delete the backlinks and proofread it again. You can add links to your blog in your Guest Post. More than 3 links to your blog in your post will always seem to be spamming as in the sense it's not a good manner to guest post on a blog. They provide you a backlink to your blog along with the Author Bio and more than that you can add 2 links to your blog anywhere in your post. It is the decent way to post to any blog on your niche. Author Bio is the only place where you can be shown as a professional in your niche. It is also one of those places where some bloggers struggle to write about them. My advice is to maintain a neat and simple Bio that would show you as a professional. Maintain the same bio in all the blogs wherever you post as a guest author. Author Bio with your social network profiles will increase your value as a blogger in the market. Lets say you have done the guest post in any blog, what will you do after getting published? Sit inside your home and waiting for the traffic to come automatically? No, then that's a mistake if you do that. You should never hesitate to promote your post even it is not from your blog. It will always help you increase traffic for your blog when both the blog owner and you promote the post. When a post is promoted only by the blog owner's side, it will reach his readers and his community. When you promote your post in their blog to your community readers, it will increase your chance of getting more Guest posts proposals and also will increase your business along with the traffic. Ultimate vision of this post is to make aware of the common mistakes most Guest Blogger does while signing up for a Guest post. Make drafts and proofread more than twice before sending it to the blog owner. And never argue with the Blog owner for more backlinks as you'll be provided more of a Professional ID through their blog that is more than enough to increase your traffic. Share your views of what are all the other mistakes that you have made while Guest Blogging and how you avoided it. Like I am always fail to engage my audience!! Engaging with the audience is a most important thing to do as it let them know that you concern for them. I completely agree with you that guest blogging generates good amount of traffic, but my question is how to get quality blogs as many good blogs don’t allow us to post as a guest blogger. What technique are you using to search blogs ? There are many blogging communities like Myblogguest, Bloggers etc., (also engaging into social media) where you will be able to find many guest blogging opportunities by engaging with the fellow bloggers. You can check the popuarity of a blog by checking the linking index through SEOMOZ open site explorer. Moreover, providing the content sound and clear will definitely allow us to post as a guest blogger. I'm glad to of found this article because I've just started to get into guest blogging. I've started to allow guest blog post on my blog and I have been writing blog posts for other websites to increase my website rankings. I was actually starting to fall under the category of people who make these mistakes, but you've helped me realize and stop making these mistakes. Hi Tomas, I'm glad this post helped you in a better way. Thanks Carla. I'm glad you liked it. Vicky, I would love if we could talk a little business, please email 2CreateABizOnline@Gmail.com and thank you for the guest blogging tips. Tomas you have shared such a nice tips with the help of this blog i'll improve my mistakes when i'll do guest blogging.